The format of this artwork is known as a triptych /trip-tik/. Common in medieval and renaissance churches, especially in Northern Europe, the hinged wings of the triptych allow for the artwork to change with liturgical needs. Closing or opening the doors refreshed the worship space and the double sides allowed the artist to pack in more biblical symbolism. 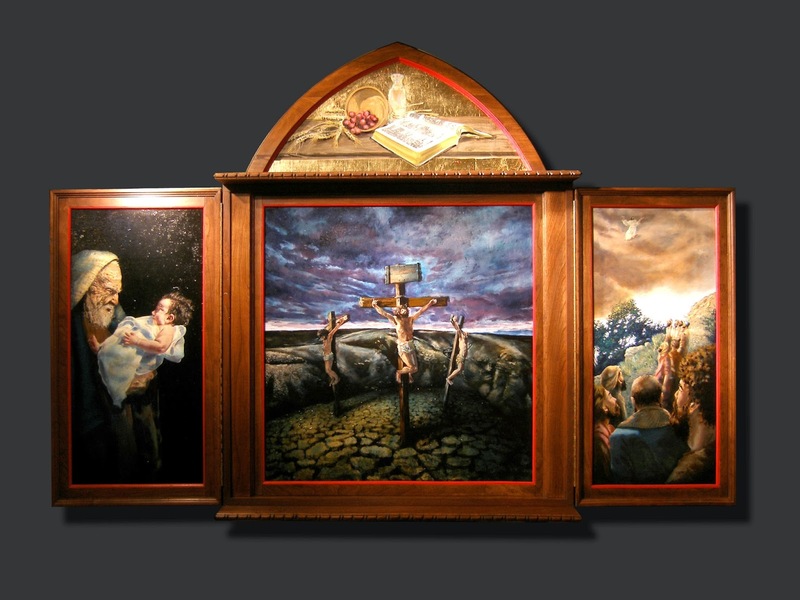 This triptych uses 5 images as reminders about the life of Jesus. When the doors are open 3 chronological images are showing. Beginning on the left Jesus’ entry into the world is shown as the aged Simeon encounters the infant God-Man. Simeon’s faith in God’s ancient promise to send a savior led to his Spirit-inspired, spontaneous song, “Sovereign Lord, as you have promised, you may now dismiss your servant in peace. For my eyes have seen your salvation, which you have prepared in the sight of all nations: a light for revelation to the Gentiles, and the glory of your people Israel.” Luke 2:29-32 The image of Simeon with Jesus is a visual link between the old and new testaments. Simeon was blessed to be present as God’s promise to Adam and Eve, Abraham, Isaac, Jacob, and all Israel was fulfilled. The eternal God was dwelling with man and Simeon had him as a baby in his arms! The central panel shows the familiar scene of Jesus’ crucifixion. In this act, humanity’s problem was solved. Jesus, who was without sin, took responsibility for the rebellion of all mankind. In exchange he offers the forgiveness of sins and opens the gates of heaven to those who believe this surprising message. Jesus’ sacrificial death and resurrection are absolutely central to the Christian faith. So this panel has the privileged central location. The moment depicted is one of anguish as Jesus experienced God’s wrath. He is surrounded by two criminals who have been judged guilty of crimes worthy of death. The criminal provide a humiliating context. Jesus did not come to dwell with just “good people”, but rather sought out those souls who were thought low and unworthy. The criminals in this painting can serve as symbols of the sinful nature of mankind. Recall too that one criminal mocked Jesus and another humbly expressed his faith saying, “‘We are punished justly, for we are getting what our deeds deserve. But this man has done nothing wrong.’ Then he said, ‘Jesus, remember me when you come into your kingdom.’ Jesus answered him, ‘Truly I tell you, today you will be with me in paradise.’” The landscape surrounding Jesus shares in it’s creator’s torment. The ground is parched, the hills barren, and the sky stirs menacingly. These elements of the image are meant to express the weight of the event depicted. Importantly, as Jesus hangs between heaven and earth interceding between God and humanity, there is a sliver of open sky in the distance. The moment is dire, but hope is on the horizon. Jesus did die, but he also stood up and left his grave. The image on the right shows the end of Jesus’ ministry on earth as he ascends into heaven. The young church had what was necessary to grow to the ends of the earth. From this small group of seemingly insignificant men, God moved his message of salvation across the globe. The disciples get a glimpse of Jesus’ exit just as Simeon met him at his entrance. The arrangement of the disciples on the hillside is meant to lead the viewer’s eye in a rising zigzag pattern as they all point our attention to Jesus. We look over the shoulders of a few nearby disciples as if we are witnesses ourselves. We share in the privilege to spread the wonderful news of a loving God who is already satisfied. We look to the skies in anticipation of Jesus’ return. 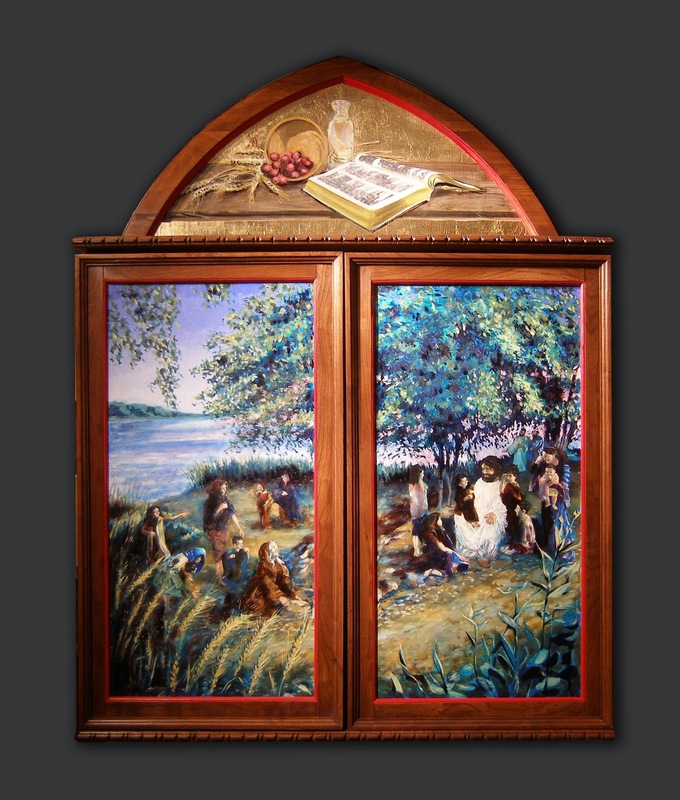 When the doors of the triptych are closed two panels form one image. By the Sea of Galilee, Jesus takes time for children. Body language tells this story. The mothers and children show their excitement and affection for Jesus who is kind and gentle. In the background two of Jesus’ disciples express their frustration. They still didn’t understand. God does not see humans in terms of social rank he just loves his lambs. The relationship shown between Jesus and these children illustrates how God would have us approach him in prayer. He had time for them and he still has time for us. The still life above shows the Sacraments. The Lord’s Supper and Baptism are powerful ways in which God approaches us. We come to worship because God comes to us through these means and the hearing of his Word. Wheat and grapes represent the bread and wine of communion in basic, timeless forms. A carafe of water emphasizes the plain yet pure nature of baptism. And the open Bible reminds us that it is the Word that gives such plain elements such power. Indeed the Word gives plain people like us endurance and encouragement, comfort and hope. The gold leaf lends an otherworldly richness to the simple elements of the sacraments. God often works his miracles with humble ingredients. Jason Jaspersen is a fine artist and educator working to blend traditional techniques with a contemporary sensibility. Jason’s portfolio includes a variety of commissioned illustrations, sculptures, and paintings. His contemplative figures reflect his interest in generations, universal experiences, and Biblical themes. Besides teaching art full time at Minnesota Valley Lutheran High School in New Ulm, MN, Jason produces large collaborative artworks, co-directs drama productions, and assists with the international student program. At home he enjoys wood joinery, growing bonsai trees, and cultivating a steady stream of personal and commissioned artwork. Jason’s creative endeavors are endured, supported, and inspired by his lovely wife and 2 children. The conception and creation of this artwork spans from July 2012 to December 2013. Sketches, progress photos and video on the making of this project are archived online at jjjaspersen.blogspot.com.